This continues our listening journey into the realm of classical music, with the aim to guide us towards experiencing the exquisite sensibilities and emotions of our musical language. Featuring LUDWIG VAN BEETHOVEN’s boldly expressive and dramatic “TEMPEST” SONATA (all three movements), and the boundaries he expanded in creating this fantasy-like piece. 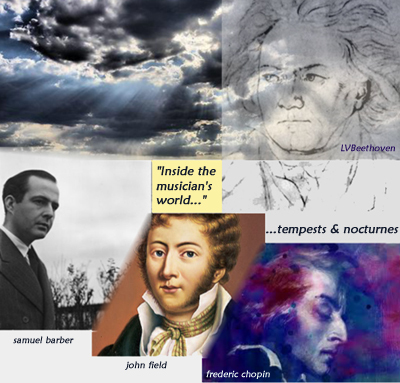 Following that will be a close listening experience of relating three diverse, yet connected NOCTURNES by JOHN FIELD, FREDERIC CHOPIN and SAMUEL BARBER. These expressive pieces together show how rich is this great musical form.